Equip yourself with all the guidance you need to diagnose, stabilize and provide the initial management of MSK emergencies as effectively as possible. Optimize patient’s disposition ranging from emergency department discharge to the operating room. A leading orthopaedic trauma surgeon and a respected emergency physician bridge the gap between these specialties to help you give these patients the best chances of favorable outcomes. Address emergency orthopaedics - both acute trauma and urgent general orthopaedic issues - at the point of care with the multidisciplinary guidance from experts in both trauma surgery and emergency medicine. Easily navigate the information you need to make critical decisions related to diagnosis; options for initial therapeutic intervention; disposition planning; and follow up through a consistent, templated format designed for rapid reference. Manage the full spectrum of traumatic musculoskeletal challenges, including infections, soft tissue injuries, and compartment syndrome, that you might encounter in a hospital emergency department, urgent care facility, or primary care setting. Make the best decisions for every patient with unique coverage of both adult and pediatric injuries. 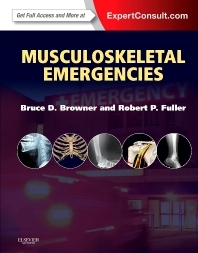 Access Musculoskeletal Emergencies online at www.expertconsult.com, search the complete contents, and download all the images.